On a Wednesday morning, the Otavalo Market practically heaves with activity. The merchants’ stalls are stuffed to the point of bursting with local wares. There are the intricately woven ponchos for which the market is famous. The traditional hat, from which Panama stole the rightful glory. A bounty of delicious cuisine— quinoa, fingerling potatoes, ceviche de chocho— for which most foodies visiting Ecuador would clamor. Otavalo, Ecuador is an unassuming town like many others in South America. There’s a historic church at the center, a bustling plaza perfect for strolling, and a seemingly perpetual clatter in the air. Buses rumble down the main drags. Smaller paved streets transition to dirt as they depart the town. Transportation by horse or donkey-led cart is not wholly surprising. Otavalo is located between the capital city of Quito and the border with Colombia. If you’ve never traveled in Ecuador, chances are you’ve never heard of the town. But if you’ve ever listened to even a sample of Andean music, its sound will undoubtedly seem familiar. The place immediately strikes a rich cultural chord that rings clear. The indigenous people are running their own show. 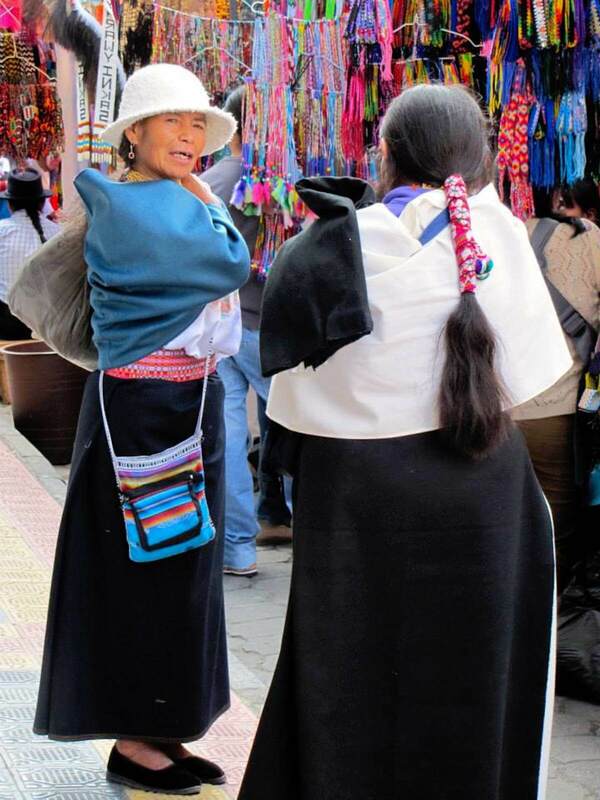 The Otavalo market appeases local demands as much as those of tourists. Traditional dress here is simple but beautiful, rather than the bedazzled versions you’d see in cruise ship shows. Locals largely go about their lives as they have for centuries. Otavalo is roughly two hours north of Quito on the Pan-American highway, in a lush valley that is over 8200 feet above sea level. 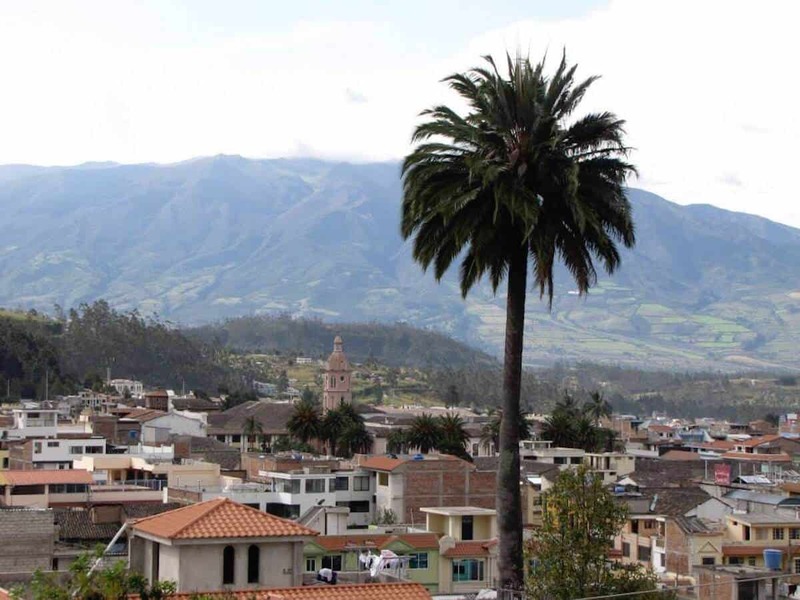 The volcanoes that border it—Imbabura and Cotacachi—both jut into the skyline, rising some 6500 feet (more) above the town. The town remains small even today, with roughly 50,000 inhabitants. Many of these are either white or mestizo, a cultural mix including native roots. Most of the area’s indigenous people live in nearby villages and visit the town on market days. As in most South American towns, people here congregate in a parque central, where they are seemingly in no hurry to get anywhere in particular. Vendors hawk snacks, and Andean musicians and other entertainers other perform amongst the easy-going throng. Coaches regularly arrive from and depart to the capital, so Otavalo can be explored as a day-trip from Quito. But it certainly has more then enough going on to warrant an overnight stay. Spending the night helps visitors get to the Otavalo Market early, before the crowds arrive. Staying a few nights can prove worthwhile for visiting nearby sites. Inside the city limits, everything is within walking distance. The colonial city center provides an array of benches, steps, and grassy swaths for lounging and people-watching. Shops, cafes, and stalls line the streets. 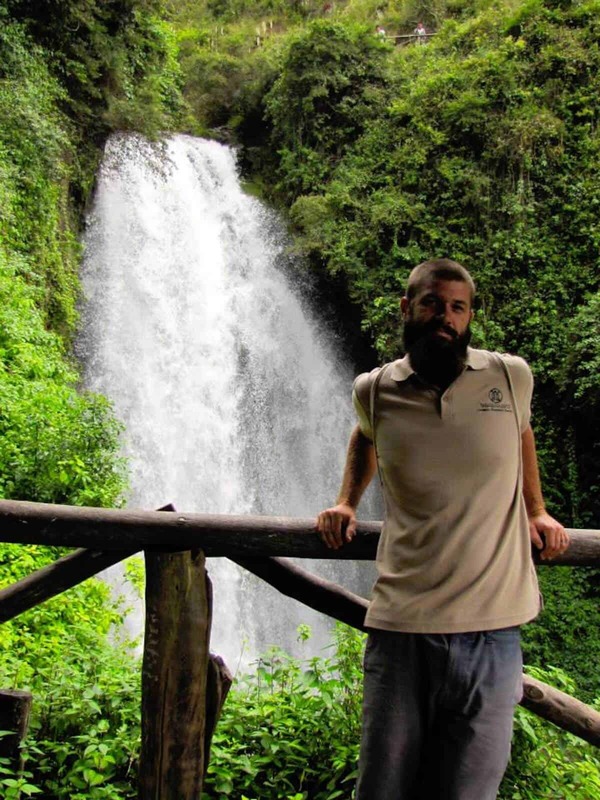 In the closest village, there is a public park with a plunging waterfall (Las Cascadas de Peguche), hiking trails, and picnic areas that can be reached by foot. Many of the nearby villages specialize in specific handicrafts, such as rugs, hats, carvings, or Andean musical instruments. They can be visited via rustic buses that offer easy passage into the surrounding mountains and valleys. Taxis will also carry tourists to nearby sites for what feels like peanuts. The people of Otavalo, Ecuador are believed to have been part of Cara culture, a pre-Colombian civilization. The Cara were forcibly incorporated into the Inca civilization sometime around 1500, along with other small local chiefdoms. All of these cultures shared similar languages, art, agriculture, and settlements. When the Spanish conquered the Inca in the 1530s, diseases caused significant damage to the indigenous population. The Spanish enslaved around 20% of the surviving locals. Most of them were relocated to hot, humid tropical regions, and more perished there. Closer to home, Rodrigo de Salazar set up large weaving workshops (obrajes) in Otavalo. Conditions were abusive and exploitive. Otavalo, which was already known for its impressive textiles by that time, became the textile center for colonial South America. But its people were basically enslaved. An earthquake destroyed most of Otavalo in 1868. That year there were two earthquakes in the area on consecutive days, August 15th and 16th, and the second of these occurred near the town. Not a single house was left standing in Otavalo, and over 6,000 people died. An annual festival, “El Retorno” (held in April) celebrates the inhabitants’ return nearly four years later. Thankfully, some Otavaleños survived all of that misery and, unlike many other chiefdoms in the area, their ethnic identity is still intact today. They lost their language in the 1600s, adopting Quichua and Spanish, but have nevertheless remained culturally distinct. 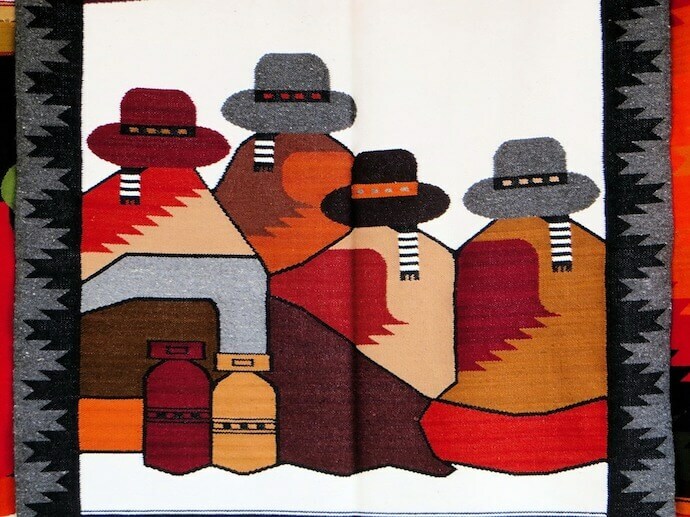 They are world-renowned for their textile artistry and Andean music style. The Agrarian Reform Act of 1964 ended debt-based manipulation, and craftspeople found themselves free to pursue their own economic gains. Today, Otavalo continues to be the hub for marketing the crafts of Northern Ecuador. But nowadays the local weavers operate more independently. Around 40,000 Otavaleños still live in the Otavalo region, with several thousand others settled elsewhere. Nearly 85% of that population is somehow involved in the production of their world-famous handicrafts. Because they haven’t stopped wearing traditional clothing, Otavaleños are easily identifiable. The men wear white calf-length pants, blue or gray ponchos, and felt hats. They have a long braid of hair, nearly down to the waist, called a shimba. The women sport white blouses with black skirts, and they display plenty of gold necklaces and red coral bracelets. 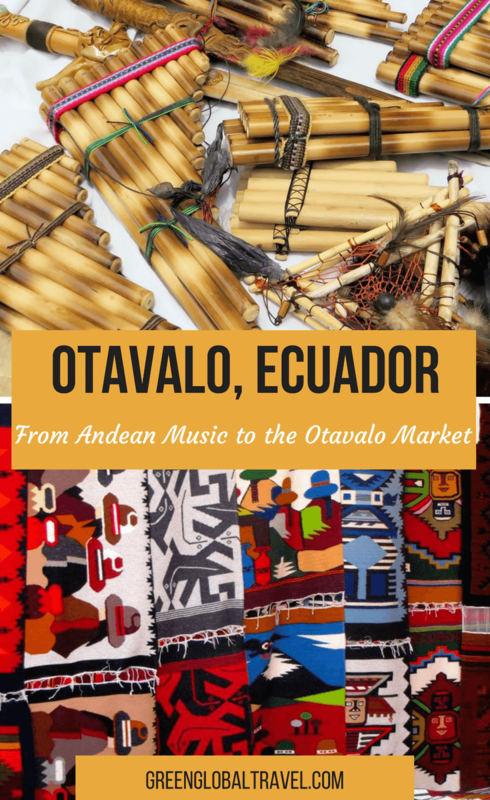 In addition to the Otavalo Market (which is easily the most famous in all of Ecuador), Otavaleños are known for spreading Andean music across the world. The economic success of this venture has helped them preserve their cultural heritage, with traditions dating back hundreds of years. Though their ancient language was lost centuries ago, most Otavaleños speak Quichua, a native vernacular, at home. This was a concerted effort to save the local culture after a long period of colonial oppression. Even so, most Otavalo natives can also speak Spanish, with a few enterprising vendors picking up phrases in English. Religiously (as in many formerly colonized regions of Latin America), most of the population was converted to Roman Catholicism. However, this was not without some assimilation of native tradition. Pachamama (Mother Earth) is offered the last drops of drinks, and many folk traditions— regarding procreation, evil, medicine, and death— remain intact. Otavaleños proudly maintain their distinctive identity. They continue to share elements of their culture through international concerts and local weekly markets. 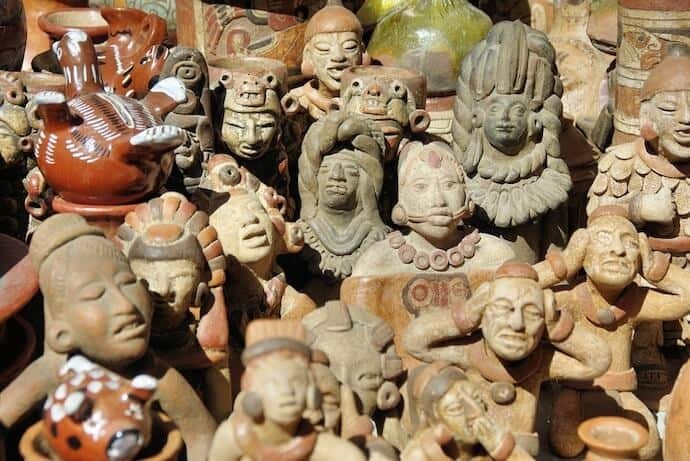 You can find it displayed in indigenous-owned stores and galleries bordering the Pancho Plaza. There are also numerous educational endeavors to keep it alive for the generations to come. The Otavalo Market is an absolute must-see for anybody interested in Otavaleño culture. On market day, over a third of the town is taken over. Before most tourists have even gotten out of bed, local vendors are commuting on mountain trails from nearby villages such as Peguche, Agato, and Iluman in order to set up their stalls. 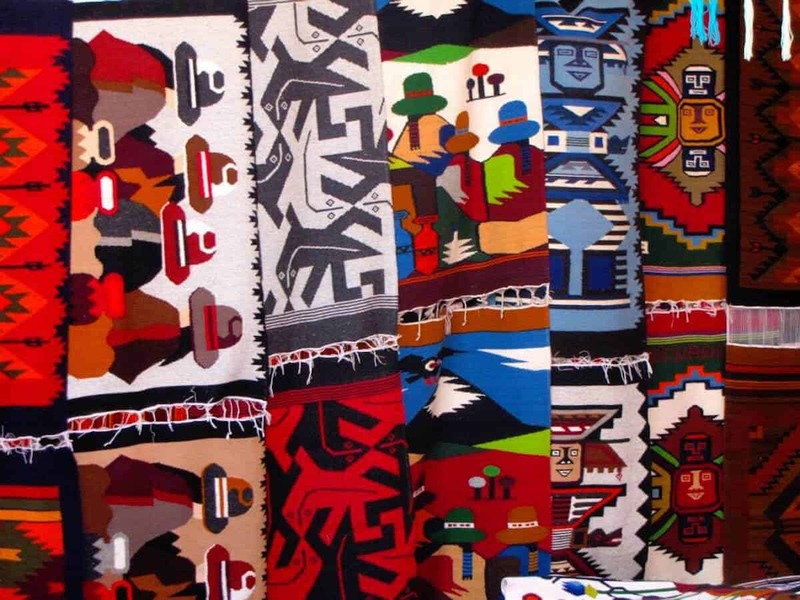 The Otavalo market is renowned for its exceptional handicrafts. Saturday is the main market day, which includes the animal market where local farmers purchase livestock (which is not recommended for animal lovers). But in certain places, such as the edge of Pancho Plaza, the market happens every day and has a much more commercial display of products. Vegetable vendors offer a wide assortment of whatever’s in season at the time. You’ll find wonderful collections of squashes, pumpkins, and beautiful produce grown in the fertile valley. Women sit amongst fat bags of grains and seeds, selling them by the kilo. Artisans work steadily in their stalls, weaving sweaters, hats, and mats. On official market days (Saturdays), the streets of Otavalo are clogged with carts. Automobiles are directed to move around the city center. Locals amble through early, avoiding the late-morning arrival of tour buses from Quito. Aisles of textiles adorn the streets with color, hats are stacked into precarious towers, and an easy bustle pushes through like a friendly breeze. It’s easy to find good deals here because the Otavalo Market is first and foremost set up for locals. Pancho Plaza is a remarkable scene to visit, but better deals can be gotten from the vendors who set up on side streets. Early in the morning, before most tourists arrive, is a great time to find great prices. Truth be told, it’s all a bargain anyway. There are also special market celebrations around the solstices. In spring, Pawkar Raymi is held in appreciation of new crops and a show of devotion to Pachamama. Held in the autumn, Fiesta del Yamor honors the season’s harvest and features chicha, a liquor made from corn. Music groups from Otavalo, known as conjuntos, have been instrumental (pun intended) in establishing the traditional Andean sound as a force in the world music scene. Generally the men play percussion and wind instruments, as well as Western stringed instruments. Men and women sing traditional songs, both in Quichua and Spanish. Not only has the music scene flourished regionally in Otavalo, but its competitions have become national events in Ecuador. Annual music festivals are held in order to discover the best of the best, who will often go on to perform internationally. This success has helped to sustain this unique culture by providing financial gain, as well as instilling a passion for preserving their own customs. Where other indigenous groups have seen their culture become a mere sideshow for tourists, Otavaleños have kept their heritage center stage and close to the heart, incorporating new ingredients of their own choosing. Otavalo’s brand of Andean music is still changing today, which is a testament to a tradition that remains alive and well. Music has been a bridge between the traditions of elders and the innovations of youngsters. Youth are being encouraged to take the musical reins, both appreciating the traditions of the past and adding their own new twists on them. For Otavaleños, music remains a crucial component in social ceremonies, such as weddings, funerals, and processions. In that way, it’s both a means of maintaining deep-rooted cultural distinctions and sharing the culture with those from outside the region. There is much more to Otavalo than merely visiting its market and listening (and dancing) to its music. For travelers looking to explore more of the area, opportunities for adventure abound both in and around the town. Several significant sites can be visited by foot. Historic cathedrals and churches can be found dotted around Otavalo. The Museo del Puebla Kichwa, an old textile factory converted into a living museum, is only a 15-minute walk away. 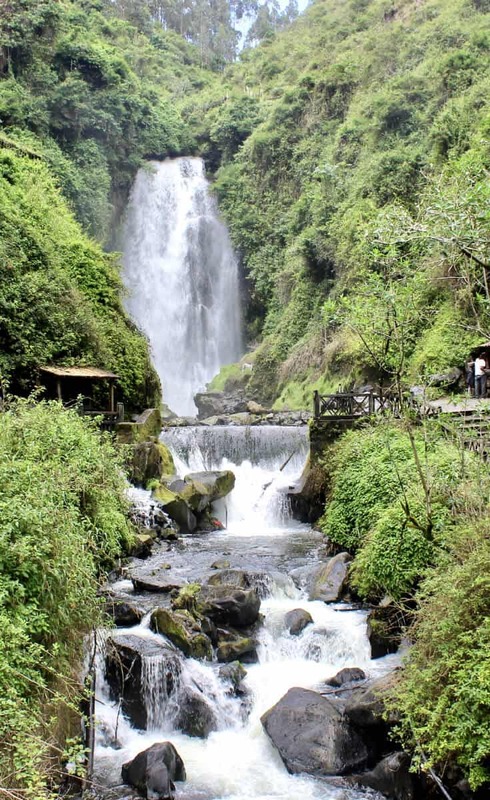 Neighboring Peguche has a 60-foot waterfall that’s a pleasant stroll away from Otavalo’s city center. Visiting the waterfall is free, and the park that it’s in has lovely trails on which to hike and grassy knolls on which to picnic. Further afield, there are a collection of mountain lakes, both recreational and sacred. San Pablo is only a couple of miles away. It’s one of the most popular lakes in Ecuador and offers aquatic activities for visitors. Cuicocha Lake, which is also known as the “lagoon of the gods,” is about 10 miles away and has a beautiful 5-hour hiking trail around it. For trekking aficionados, there are several seriously tall mountains to scale. Imbabura Mountain, the mystical father of the local people, is right outside of town. At over 15,000 feet, it’s amongst the highest peaks in Ecuador. Cotacachi Mountain, part of the Cotacachi-Cayapas ecological reserve, is slightly higher and can be climbed with a guide. Many of the surrounding villages specialize in specific handicrafts. 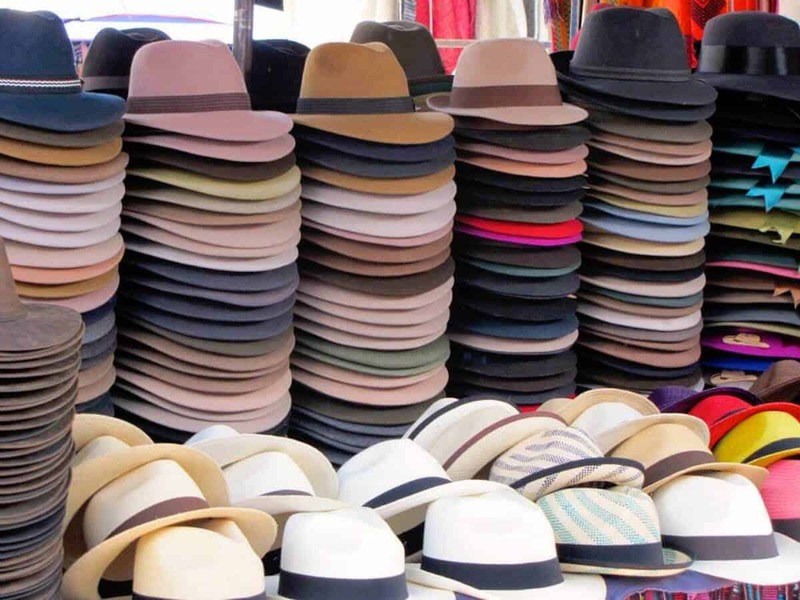 For leather goods, the Cotacachi village is the place to visit. 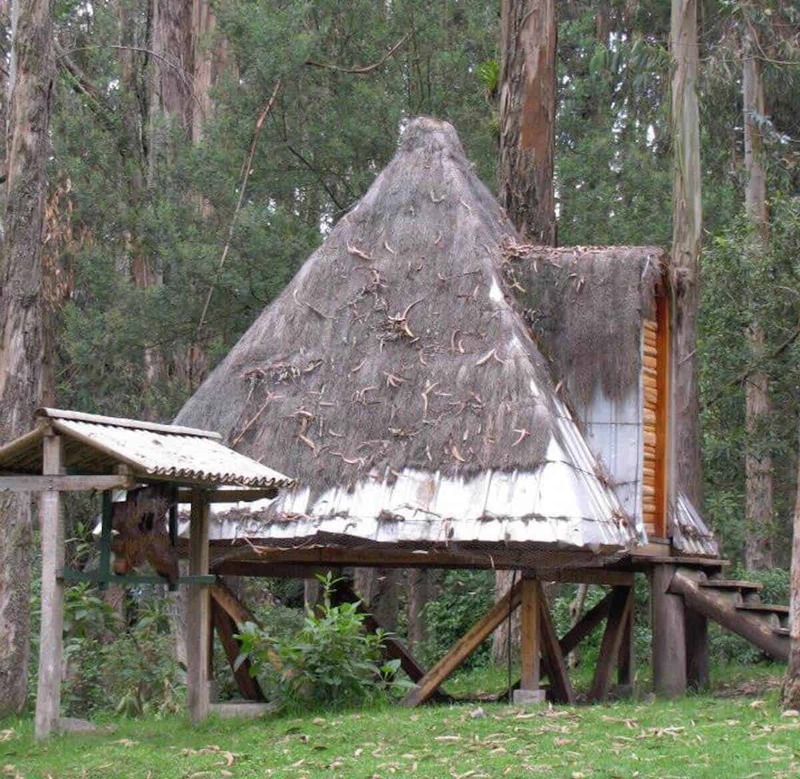 Ilamán is the spot for shamanic experiences. 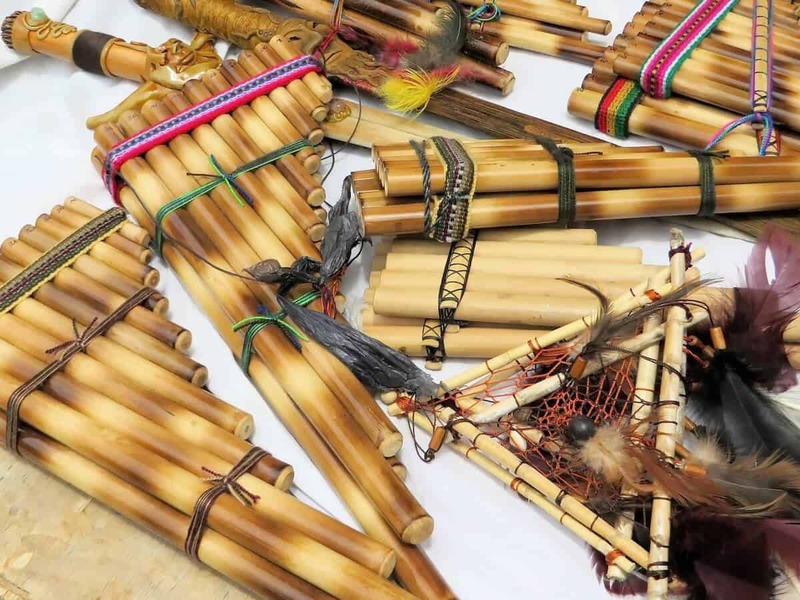 Peguche is known for weaving and has a famous flute player/maker. In La Calera, they make jewelry. Some classes and workshops are available in the area as well. Kawsaymi has cooking classes for preparing Kichwa food. There are a couple of Spanish schools in town for learning the language. It’s even possible to make Andean instruments in a workshop with a professional. For those staying in and around Otavalo, accommodations cover the range of budgets and styles. Hostal Flying Donkey is on the cheaper end of the spectrum, but it does have a rooftop kitchen and patio with nice vistas. The staff is happy to help with setting up tours and transportation. For those on a tight budget looking for a quick stay, this is a great option. Check Rates or Read Reviews. Mid-range rooms (in the $40 to $100 category) can be found at Doña Esther. This charming little hotel is centrally located and in an old colonial house with a pretty courtyard garden. It also has a noteworthy restaurant, Arbol de Montalvo, that serves international food using local ingredients. Check Rates or Read Reviews. At the upper end of the budget spectrum is Hacienda Cusin, a restored 17th century estate with lovely gardens and plenty of art. It’s located just outside of town in San Pablo de Lago, near the lake. But it’s the kind of hotel that is a sight to see itself, both inside and out. Rooms are going to cost you around $100 and up. Check Rates or Read Reviews. There are also plenty of homestay possibilities in the villages around Otavalo. These are a great option for providing direct income to locals and getting deeper, more immersive exposure to their culture. Runa Tupari Homestay Lodge is a community-run tour company that offers homestay options in Cotacachi (about 20 minutes from Otavalo). They also have volunteer programs and guided tours. Check Homestay Options. In a world consumed with technological advancement and modernization, the people of Otavalo have staked a claim to conserve their culture. The language, the art, the music, the unity— all has value. Those Otavaleños who have found success through their skills return to share an appreciation for their culture, teaching the younger generations about their uniqueness. Many indigenous populations have struggled after colonialism and have since become reliant on aid programs from developed nations. But the people of Otavalo have managed to locate their own route to survival. Best of all, they’ve done it by embracing who they truly are as people rather than adopting new cultural identities.